Detective David Caron warned residents to lock their vehicles in order to prevent more thefts. WATERVILLE — Seven unlocked vehicles on streets near each other were burglarized Tuesday in what police believe are related incidents. A suspect has not been identified yet, and no stolen items have been recovered, according to Waterville Detective David Caron. 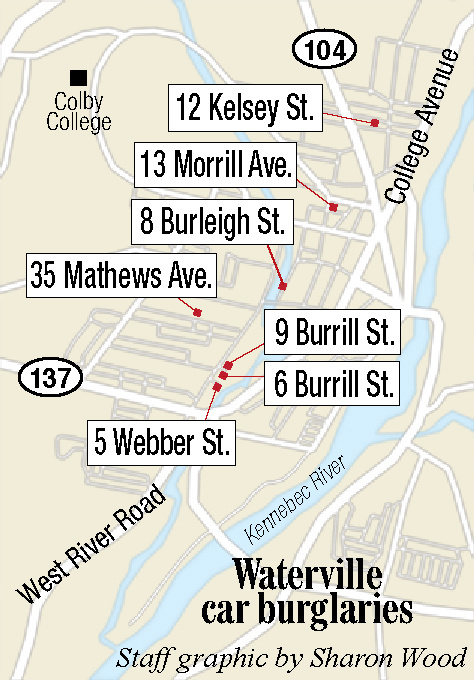 Two of the burglaries took place on Burrill Street and others were reported on Webber Street, Mathews Avenue, Burleigh Street, Morrill Avenue and Kelsey Street — all of which are short distances away from each other. The incidents happened between 7:55 a.m. and 2:12 p.m.
Caron said that there were no forced entries and that the suspect targeted unlocked cars. While police search for a suspect, Caron cautioned the public to secure their vehicles at all times.